The past half-century is full of moments where fears proved wrong. Last week’s summit between North Korea’s Kim Jong Un and South Korea’s president Moon Jae-in was as close to breathtaking as it gets in international relations. In the space of a few months, the world went from trepidation about a possible nuclear confrontation — from Kim calling President Trump a “dotard” a few weeks after Trump warned that North Korean threats would be met with “fire and fury” — to a sudden sense that detente might be in the offing. But a chorus of naysayers now warn that the Korea impasse remains hopeless. The Washington Post’s Richard Cohen writes that Trump’s “prestige and his leviathan of an ego will be on the line, and war will be a greater, not lesser, possibility.” Bruce Jones, director of the Brookings Institution’s foreign policy program, argues that “a failed Trump-Kim summit could lead directly to military conflict.” There are, indeed, hurdles. The United States could insist on complete, verifiable North Korean denuclearization as a precondition for further negotiations, which would likely put a quick end to the outbreak of goodwill. Kim could demand that Trump withdraw all U.S. forces from South Korea. And then we could soon find ourselves back to square one, or worse. What if, however, we’re underestimating the possibility that things go right — and, rather than the verge of war, we’re on the verge of peace? It’s not assured, but it’s not impossible; the past half-century is full of moments where fears proved wrong. Take the fall of the Berlin Wall in 1989. President Ronald Reagan presagedthe communist system’s rot and expressed skepticism that it would ever change: “In the Communist world, we see failure,” he said, “Technological backwardness. Declining standards of health. Even want of the most basic kind — too little food.” But few in 1987, when he spoke those words, would have predicted that within two years, the Eastern Bloc would fall and be replaced by starry-eyed reformers. Thirty years later, there may be signs of sliding back in Poland and Hungary, but none of these countries is close to the repression of the decades following World War II. In 1990, South Africa’s president, F.W. de Klerk, opened parliament with a speech announcing his intent to lift the ban on the anti-apartheid African National Congress, release imprisoned leader Nelson Mandela and bring an end to the apartheid state. While secret negotiations between Mandela and the government had been going on for several years, the sweep of de Klerk’s announcement, the release of Mandela nine days later and the rapid unraveling of the apartheid system took most by surprise. Those initial moves were greeted with intense skepticism on both the left — that the regime would free Mandela but find a way to maintain apartheid — and on the right, that freeing Mandela would lead a confiscatory, anti-white revolution. “The release of Mandela, for all we can know,” William F. Buckley mused, “may one day be likened to the arrival of Lenin at the Finland Station in 1917.” But in 1994, Mandela became president of a multiracial, constitutional republic, and such fears proved unfounded. A similar end to a deeply divided system appeared in the offing in 1993, when months of secret negotiations led to the Oslo accords between Israelis and Palestinians, which saw not only a formal end of hostilities between Israel and the Palestine Liberation Organization, but a dramatic White House handshake between Israeli Prime Minister Itzhak Rabin and PLO leader Yasser Arafat. Many at the time worried that the accords would be, effectively, a “Trojan Horse” — a first step toward the end of the Jewish state — and yet for more than eight years, the truce held. Oslo followed the equally dramatic 1978 Camp David accords, the result of 12 days of negotiation between Egypt’s President Anwar Sadat and Israel’s Prime Minister Menachim Begin leading to a formal, albeit cold, peace that has surprisingly survived for 40 years, a decade longer than the preceding 30 years of war between the two countries. The 9/11 attacks and the resulting U.S. invasion of Afghanistan focused the world’s attention in late 2001, understandably overshadowing China’s becoming a member of the World Trade Organization in December 2001. In many ways, this was the second act to the bolt from the blue in February 1972 when President Richard Nixon and Secretary of State Henry Kissinger flew to Beijing to meet with China’s Chairman Mao Zedong. That opening heralded an end to the Asian Cold War. China’s move into the WTO three decades later completed that process. The integration of China into the global system has seen more than a billion people move out of poverty and into the middle class in less than 20 years. Whatever tensions may exist now, that surely has been one of the more positive stories of the past few decades. The Korean conflict is one of the last unresolved political issues between the world’s two economic superpowers. The Korean Peninsula devolved into war in 1950 with China supporting the north and the United States the south, and with tens of thousands of American troops, and hundreds of thousands of South Korean, North Korean and Chinese troops dying in a still-unresolved war. 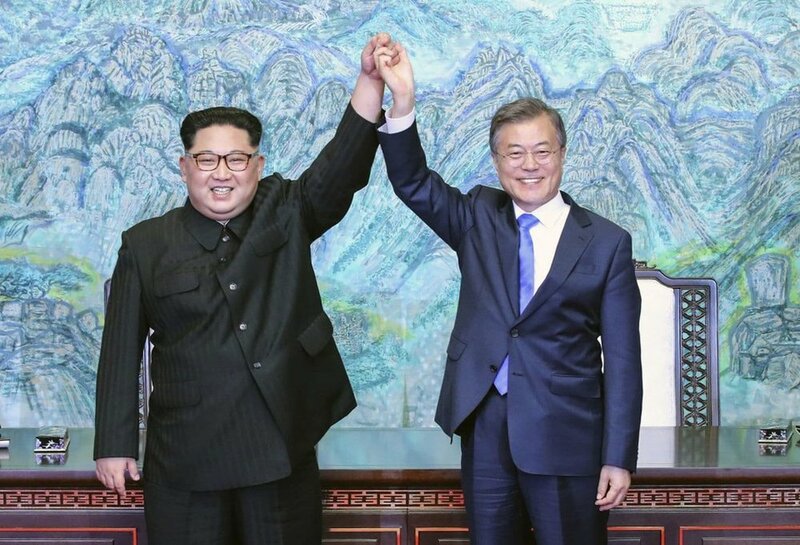 The Kim-Moon summit, subsequent to Kim’s March Beijing trip and in advance of the pending Kim-Trump summit, has some of the hallmarks of a breakout moment. All the players have an incentive to end this conflict: The North cannot go on as an economic pariah no matter how well armed, and the South can look to how West Germany integrated East Germany after 1990 as a future model. Neither China nor the United States have their interests served by war or crisis. It’s true that in world affairs, most breakthroughs are the product of slow, behind-the-scenes thawing or systemic shifts that become fully evident only in retrospect. But that doesn’t make such moments less significant. And, with good reason, we remain vigilant about the prospect of war — Syria, Afghanistan, Gaza and Crimea all leave us prepared for collapse or disorder. But concord is part of the human experience just as surely as conflict — we’ve seen it in our lifetimes, and we shouldn’t lose sight of that. Healthy skepticism is warranted in international relations, but underestimating the potential for peace has its own costs, including the risk that we’ll obscure any vision for peace, and thereby squelch efforts to achieve it.